The title says it succinctly, but I can’t help but to add a few more words and images. It seems like every time we visit Kentucky, it gets scorching hot. We might have to switch to December visits, but that will bring logistical problems of its own. How hot was it? Pretty hot! How hot is 109? 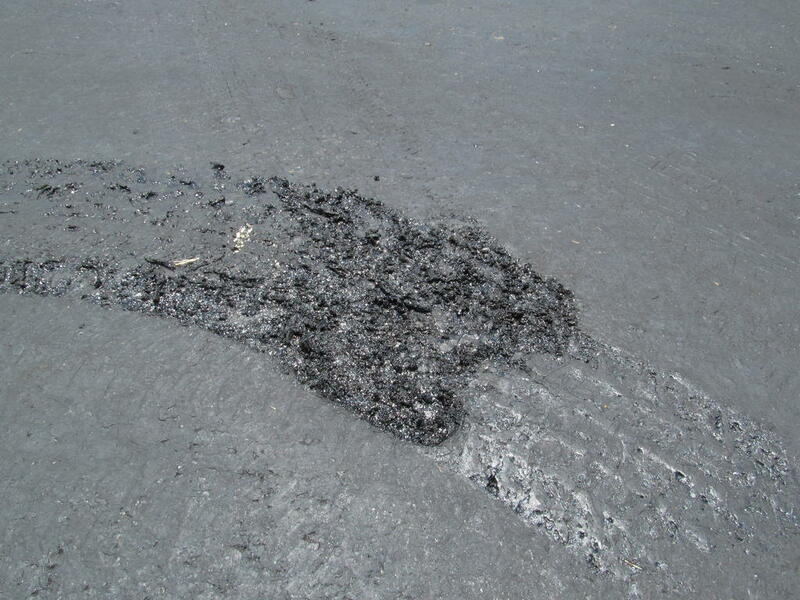 Hot enough to melt asphalt. I was foolish enough to walk barefoot from the hotel room to the pool across a parking lot. It wasn’t melted like this, but it was hot enough to burn the soles of my feet. They hurt for hours afterwards. But the pool sure felt good. 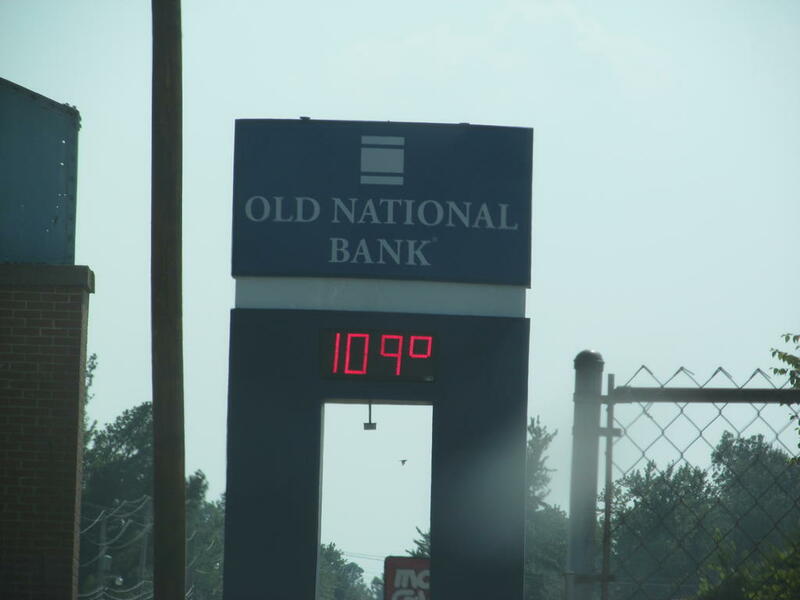 Today’s temperature of 108 in Paducah, KY tied the all time high temperature record for that city. Ugh. I wasn’t in Paducah, but I may as well have been. Now I’m going to go examine my feet for blisters! When astronomers assemble a new telescope and aim it at the sky for the first time, they call that “first light.” Well, my new Canon SX150IS came in today to replace my broken SX110IS. I must confess that “first light” for it was a bottle cap lying on a table. And so was second light. I deleted those before downloading them, but I’ll share third-fifth light with you. 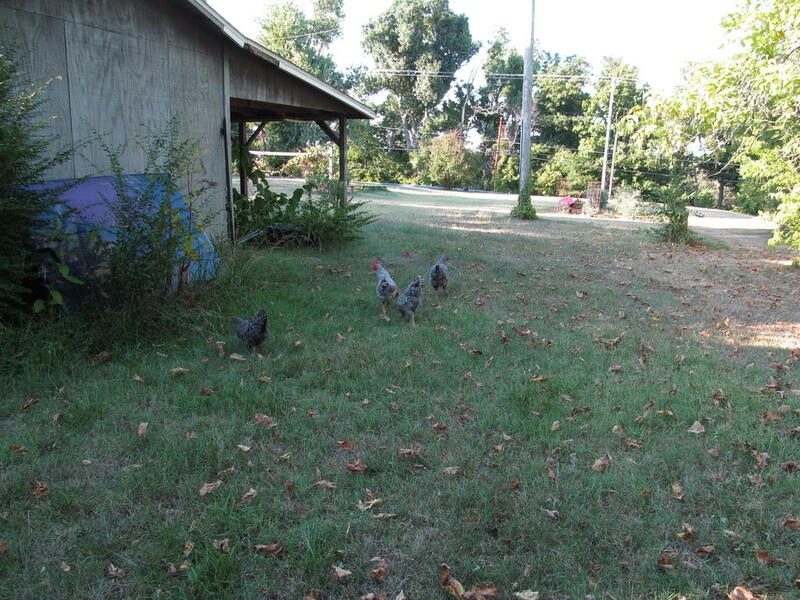 This one came about after my Mom was talking about how she needed her chicken coop moved to a new spot. The temperature is supposed to hit 107 here tomorrow, so getting them into a shadier spot was kind of important. I offered to do the deed with David’s help. Well, her chicken coop was a lot heavier than it seemed. We lifted it up on one side and started dragging it across the grass, and that’s when all 12 chickens flew the coop so to speak. We spent the next 15 or 20 minutes herding them back into the coop. Penny – a herding dog – was absolutely worthless at this. But of course, she had never even seen a chicken before yesterday, and she has exactly zero training when it comes to herding actual animals. Still. Before it was all said and done, I watched Dad try to catch one of the roosters. It got away, but I could see how he was trying to do it. I emulated his technique and that was met with some success. Basically, Dad was moving in low and slow, and then snatched at the hen’s legs. When I tried it, I caught one leg, but with the chicken thusly restrained, getting hold of the second leg was somewhat trivial. I popped her into the coop. The rest of them were lured in with bread. This lens isn’t quite as fast as the SX110’s, but I guess that’s OK. It has more zoom power and lots more pixels to make up for that. It goes down to an f-stop of 3.4 vs 2.8 for the SX110. So far, I am very pleased with it. OK, more on the fishing trip to the Red River Trout Dock. The first time I finished paddling my canoe, I hauled it up on the dock and then dragged it up to the ramp leading to the shore. I was getting ready to carry it back up the hill to my car when the owner of the dock stopped me and suggested I just leave it down at the dock. I was not going to argue! He is a fantastic guy, and I very much appreciated his gesture. He also stopped me before I went out the first time because I didn’t have a “throwie” cushion in the boat. I did not know this, but Arkansas law requires one of those, even if everyone in the boat is wearing a PFD. He loaned me one while we were there, and that is another reason I think he was a pretty swell fellow. The order of the rest of the events is still something of a blur to me now. I guess getting up every morning at 5:00am will do that to a person. So I will just put up a few photos and comment on them. We’ll start with some black vultures (Coragyps atratus). These are not exactly easy to see in the photo. 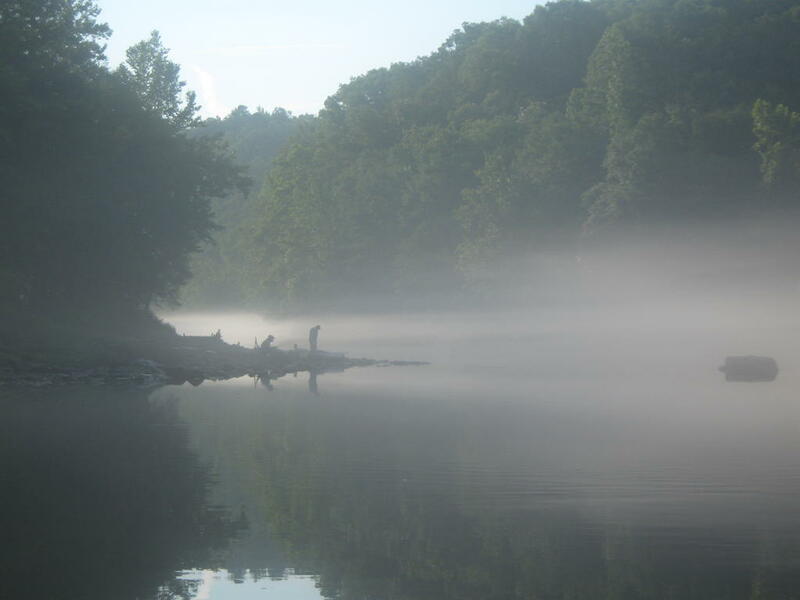 These early morning paddling excursions were not the greatest for photography because there was always so much fog. But there are three individuals in this shot. They were feeding on something – maybe fish – but I couldn’t get a good look at that. 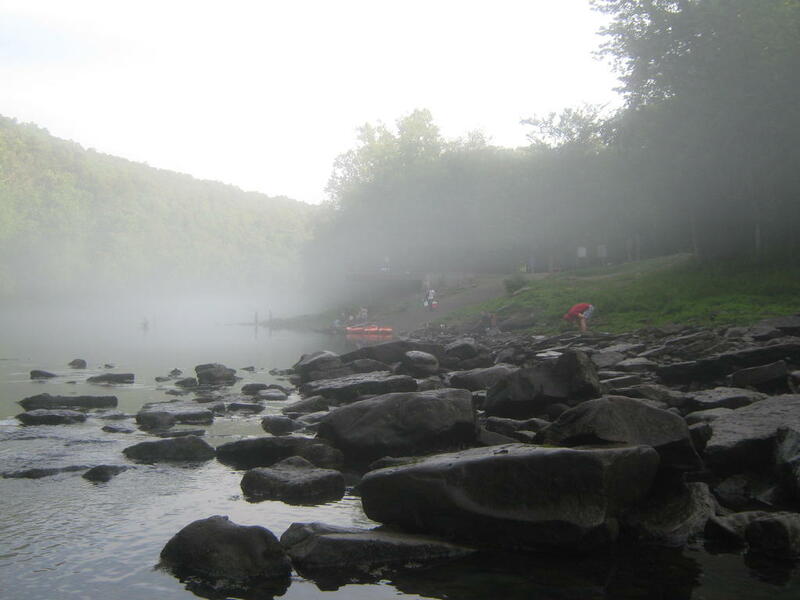 The river was always so foggy in the morning because the water is always about 46 degrees. The water is fed through the spillway from the bottom of the lake. I don’t remember how deep the intake is, but I seem to think it was 165 feet. Maybe more, or maybe less. I do remember that it was between 100 and 200 feet though. That is the reason they can even have trout in Arkansas. Trout like cold water, and Arkansas is not reknown for that. But when they built the dam they created a cold water river, and that killed all the native fish. So now they stock it with trout. The fog wasn’t always horrible for photography though. Here’s a shot I liked because of the fog. 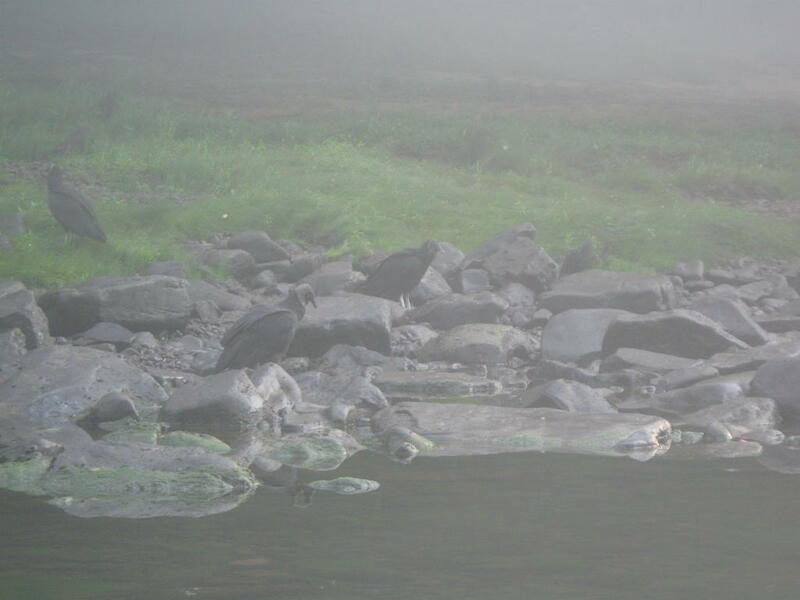 I think these were the first people I saw on the river that morning. I heard them long before I saw them though. And now I will embarrass myself by posting some eagle pictures. I know these are not all that good, but I can make plenty of excuses for that. First, I am not much of a bird photographer. Second, I was using my brother’s camera (which was unfamiliar to me), since mine won’t turn on any more. Third, there was lots of fog between me and the bird. 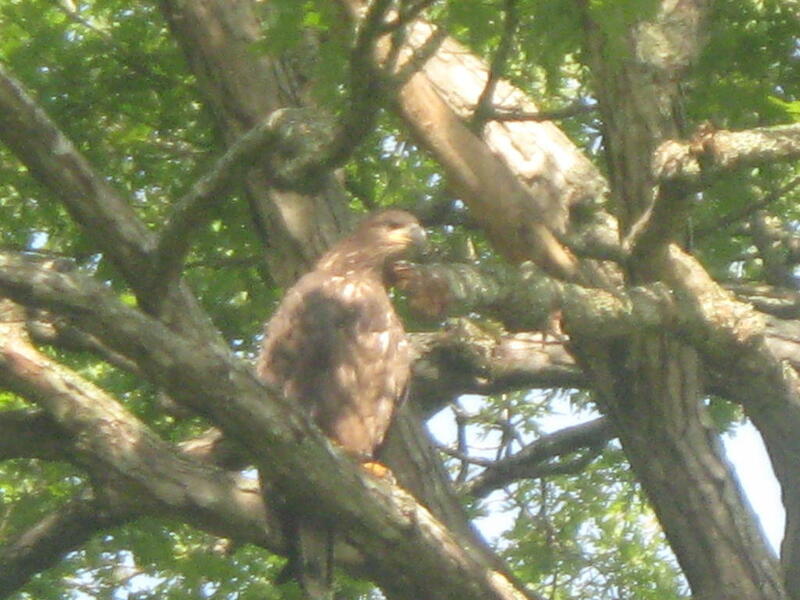 But I don’t have many eagle photos, so I will post this one anyway. I think this one is about a year old. At this age, they are even larger than their parents, which is something I learned while I was down there. They don’t get a lot of exercise as their parents feed them, and they eat a lot. Here’s one of the parents. Their nest is on an island in the river, and there is a bluff on the other side. When the youngsters were born, people could go to the top of the bluff and look down into the nest. That’s pretty cool. My uncle told me how to find the nest, and I did go out and see it. Talk was that they had another brood in the nest, but I couldn’t tell. But I also didn’t go to the top of the bluff either. 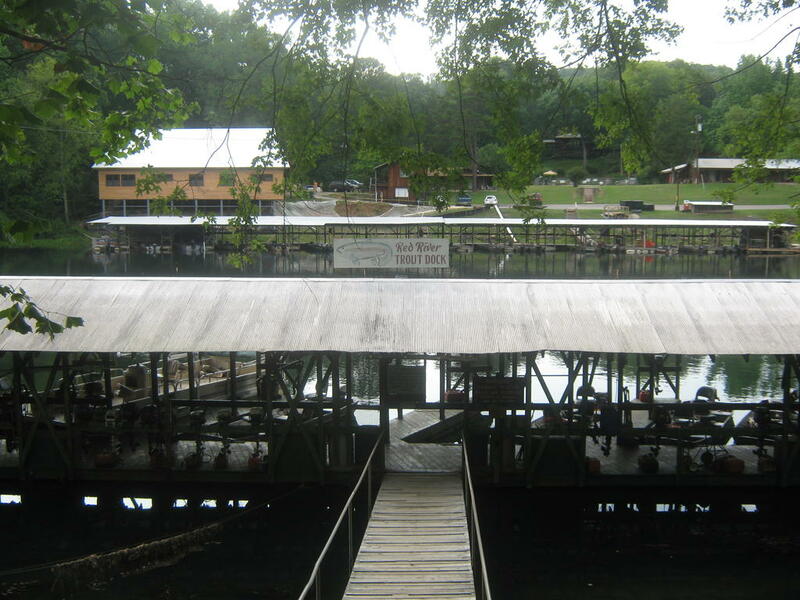 Here’s a shot of the trout dock. I took this one in the afternoon (or late morning, or maybe in the evening). This was after the fog had burned off. I took this one on Friday morning. I was paddling up to their boat when Rachel took the photo of me that I am now using in my banner. Her shot is better than any I took myself during the whole trip. On Friday afternoon, Beth and I set out for Conway to see Beth’s friend and our former next door neighbor, Haylee. We got to spend four or five hours with her, her siblings, and her mother, and then we drove back to the trout dock. On Friday evening, I took my memory card out of my brother’s camera and gave it back to him. I was sure glad he loaned it to me. Then on Saturday morning we went down to the dock at the crack of dawn and he helped me get my canoe in the water. Unfortunately, when he did this, he leaned forward and is camera slipped out of his shirt pocket and landed plop in the water. We fished it out with a long-handled fish net, but his camera is now toast. I felt really bad for him, as I kinda know what it’s like to have a broken camera! His might eventually come back, but that seems pretty unlikely to me. It was on Saturday morning that I saw the most wildlife. 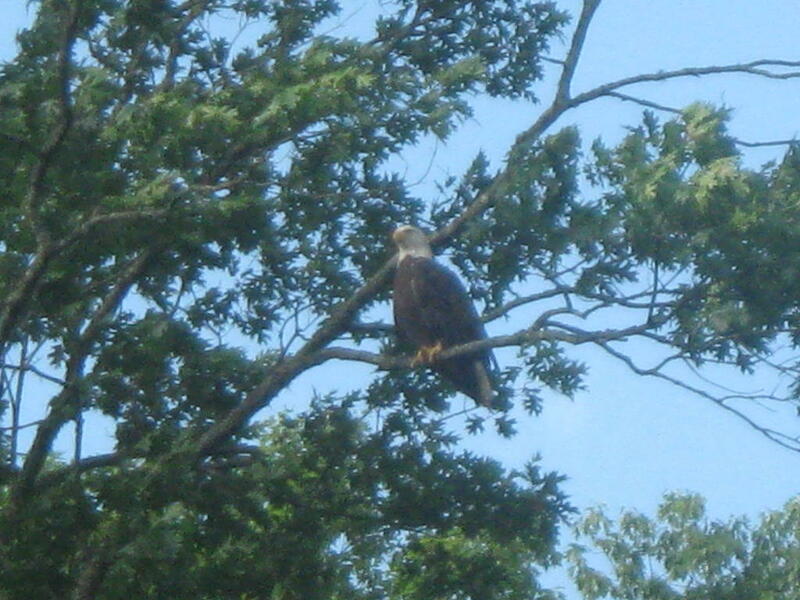 I saw the eagles again, as well as two deer, a Canada goose, and a beaver. That was a lot of fun just watching them. I took out around 9:00am and started packing. Jonathan and Beth got back from fishing shortly after that, and we put on our church clothes and found the Heber Springs Adventist Church. It was pretty small! Including the three of us, attendance was 16 that morning. But it was a very nice service, and the people were quite friendly. I was glad we got to spend some time with them. After the service we changed clothes in their bathroom, and then headed back to Dawson Springs, KY. Beth and I found a geocache in Missouri on the way, which is our first and so far only MO cache. We also collected an Arkansas geocache near the dock on Friday when we drove down to Conway. The drive back to Dawson was long and uneventful, but I think that’s a good thing in a road trip! Tonight I ordered a Canon SX150IS. That is pretty similar to my broken and well-used SX110IS, so I think I’ll like it fairly well. I went ahead and had it shipped to my parent’s house, so maybe I’ll get to post some photos again in a couple of days. This is the first time in a week I’ve had time, energy, and an adequate Internet connection to post. I’m a tad low on the energy, but I’ll do what I can to at least give an initial report. 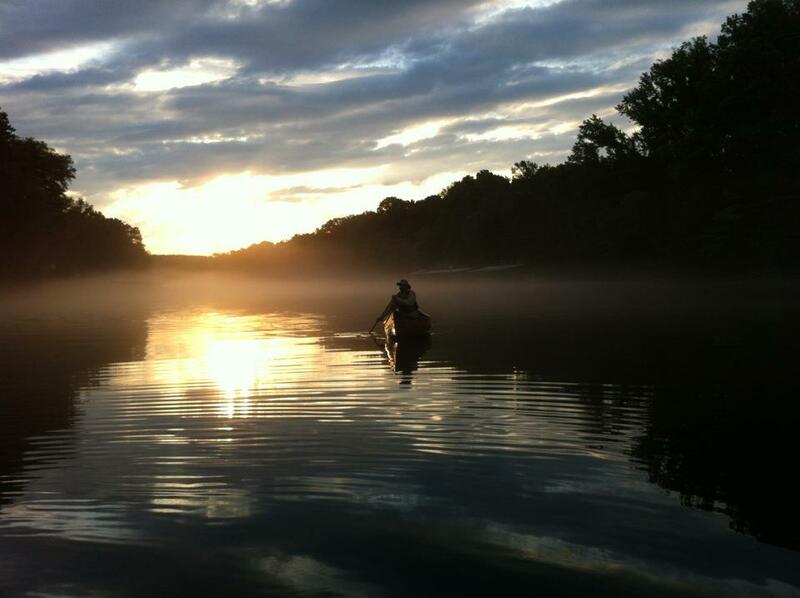 We’ll start with this photo my niece Rachel Gogel took of me on the Red River at dawn on Friday. I think it was Friday anyhow. I liked it so much I made it my new header photo, but you have probably already noticed. Beth, Jonathan, and I arrived in Dawson Springs Tuesday evening. We stayed at my parents house, and got up pretty early Wednesday morning so we could drive to the fishing hole in Heber Springs, AR with my parents, my brother Mike, my niece Rachel and her fiance, and my Dad’s brother Dallas. It was a long drive, but it was also pleasant! When we got there, I went to the store with Dad to buy some groceries. The generators were running at the dam, so the river was up. Dad doesn’t like to fish when the river is up (it’s a lot harder to catch fish then), so he opted to not go out the first evening. Beth was disappointed, because she was going to go out with him. I unloaded the canoe and carried it down to the dock, and the two of us went out. Everyone seemed alarmed about me going out on the river with it up like it was, but it was pretty trivial compared to the rivers I have run in the past. It really didn’t present much of a challenge at all, actually, and I was able to paddle upstream without too much effort. It was a nice paddle, and we came in before it got dark and had some supper. In the morning we got up at 5:00am and had a quick breakfast. Then everyone was on the water by 5:30. Here’s Beth and Jonathan with Dad getting ready to go out. This was Beth’s first fishing trip. Everyone was pretty well convinced that she would be bored with it pretty quickly – if not in ten minutes, then certainly within an hour. But that did not happen. She went out and started catching fish – and she was hooked. I do not like to fish, so I got in my canoe and had a nice paddle. I went almost all the way up to the dam (which was about three miles). I turned around when I ran into a bunch of fishermen at a little riffle. I could have attained the riffle, but then there were several guys with lines cast across the river, and I didn’t want to cross them (the lines, or the fishermen). Also, I don’t like to have an audience when I attempt to attain a riffle. I turned around and headed back downstream. It was a magnificent paddle! Over the course of the stay there, I saw a pair of otters (a first for me), a muskrat, two deer, a pair of bald eagles and their two chicks (which were larger than the parents), a couple of hawks, several great blue herons, countless swallows (exact species unknown), and trout. Unfortunately, my camera has finally given up the ghost. It will no longer turn on. My brother very generously offered me the use of his though, and I gladly accepted. So I will be sharing some photos as the week progresses. But right now, I should probably get to bed! 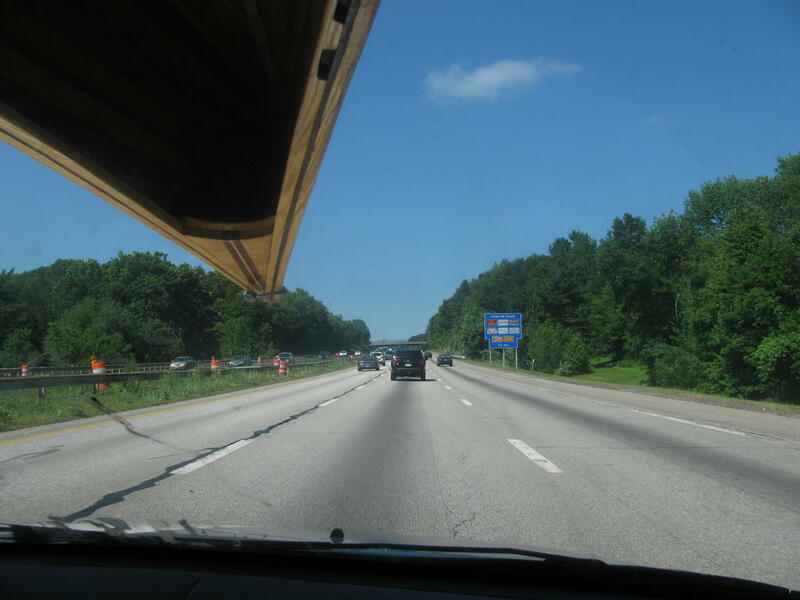 Yesterday after church I loaded my canoe on top of my car in preparation for a road trip (more on that later). But since it was up there, I figured I ought to go paddling. At first I was thinking I’d do something easy, like Sandogardy Pond. But as the idea germinated, it morphed into a Merrimack River trip. Still easy, because I was planning to put in, paddle upstream, turn around, and take out where I had put in. That neatly solves the problem of getting the car to the take out – but at the expense of having to paddle upstream. So with the plan all formulated, Beth and I executed. There’s a river access point about five minutes from my house (by car). So off we went. I brought my camera and the GPS, because the closest geocaches to my house that I have not found are all along the river. Why not pick off a few? For good measure, I put the GPS in the camera bag, and put the camera bag in a gallon ziplock (just in case). The first one was on an island. Beth managed to find it before I had the coordinates entered into the GPS. Beth wanted to learn how to steer the canoe, and since that is mostly done from the stern, we traded seats. I waited until we were finished paddling upstream to do this, as it’s a lot easier to steer when going downstream vs upstream. She was pretty happy that I let her try that. We had passed two geocache locations, but decided we’d hunt for them on the way back vs on the way up. There were two more on the agenda besides the one on the island. One was in a little cove, and we paddled into it (I did do some of the steering from the bow). We looked and we looked, but we couldn’t find it. So I started trying to get us turned around. There wasn’t quite enough room in the cove to do a 180, and in my attempts to force the boat around, I lost my balance and fell backwards into the gunwales. I don’t know how it even happened, but the next thing I knew, the gunwales were under water, and shortly after that, we were both standing in the river with the canoe next to us. How embarrassing! I thought I knew how to handle a canoe! The first thing I did was grab my zip-locked camera bag. Whew! The zipper was closed, and the camera bag was dry. I clambered out of the river and put the camera on the bank. Meanwhile Beth was not very happy, and asking me why I had done that. If only I knew sweetie! I hauled the canoe out of the water and dumped out most of the water. But there was still too much in there, so I waded back into the water and lifted the stern up over my head while the water poured through the scuppers. In short order, the boat was dryer than we were. We reloaded, and set off again to look for cache number three. Before we got there, Beth had forgotten how upset she was with me. The third cache was located in a tree on a very steep bank, and there was really no place to pull the boat out of the water. So Beth climbed the bank, and I stayed in the canoe to keep it in position. She searched everywhere, but that cache was nowhere to be seen. She got back in the boat (but had given up on steering by then – and let me have the stern again). We paddled back towards the put-in/take-out. She picked a few and pressed them when we got home. It took me a while to get my wet clothes off. I did that in the kitchen rather than traipsing through the house, mud and all. Then I took a shower. After I was all cleaned up, I looked at poor, poor Penny who did not get to go paddling with us (I’ve tried that before, and it doesn’t work very well – she does not like to stay in the boat). I explained to him that I was a “mad botantist” rather than a “mad zoologist” because plants don’t run away when you approach them with a camera. They are a lot easier to work with as subjects! So here are some of the results of my “mad botany” from the hike. I don’t remember if this is plain old dogbane (Apocynum cannabinum) or intermediate dogbane (A. medium). I know one of them has reflexed petals (as this one does), but now I don’t remember which one of them that is. And I don’t have my books with me right now, so I can’t look it up. Wikipedia isn’t helping me out here any either. 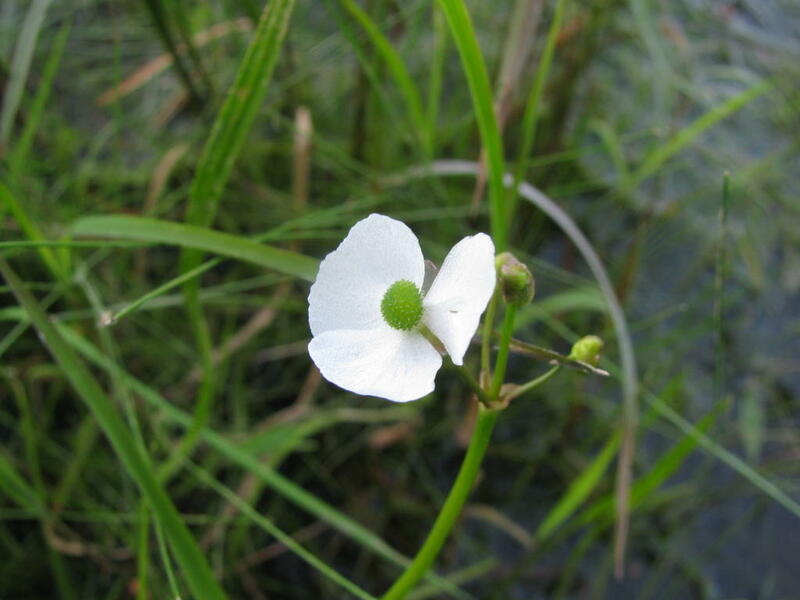 When we got to the pond I found some grass-leaved arrowhead (Sagittaria graminea). 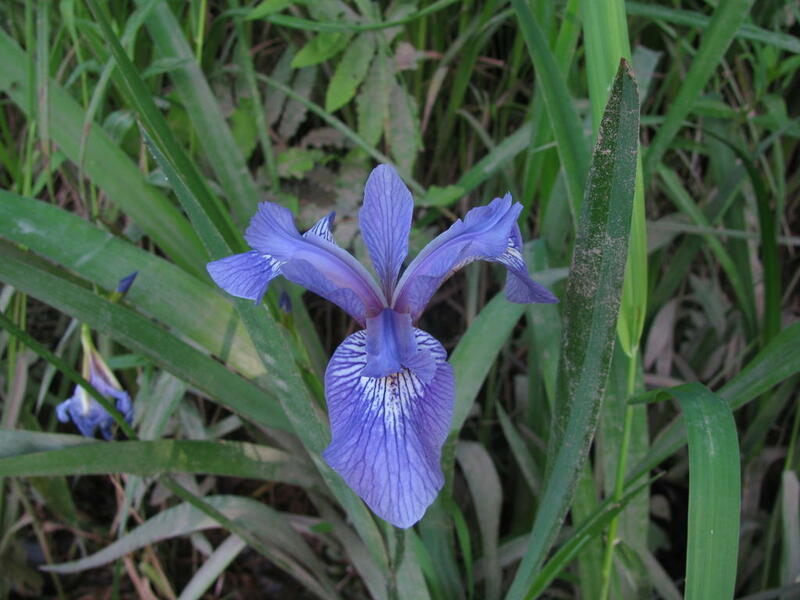 There’s not a lot of this growing at the pond, but a few always seem to bloom right near the dock. 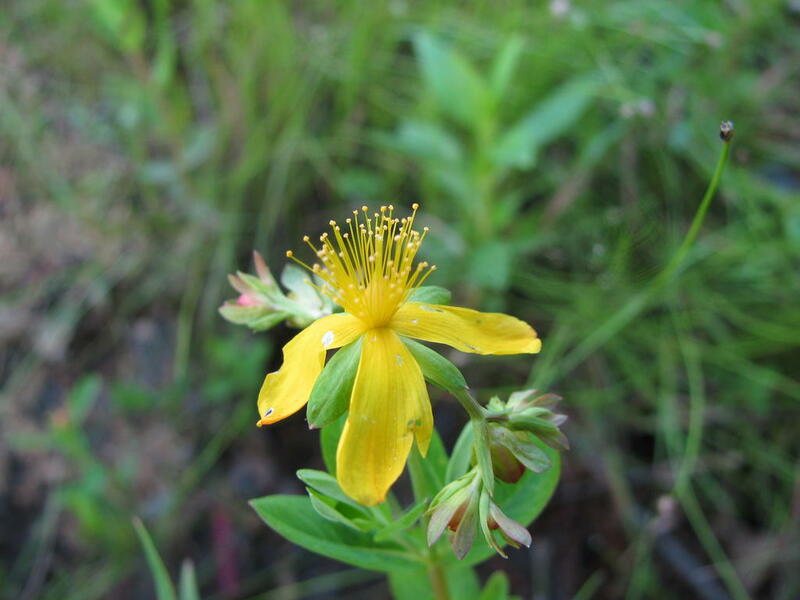 The Connecticut Botanical Society says this blooms from July to August. 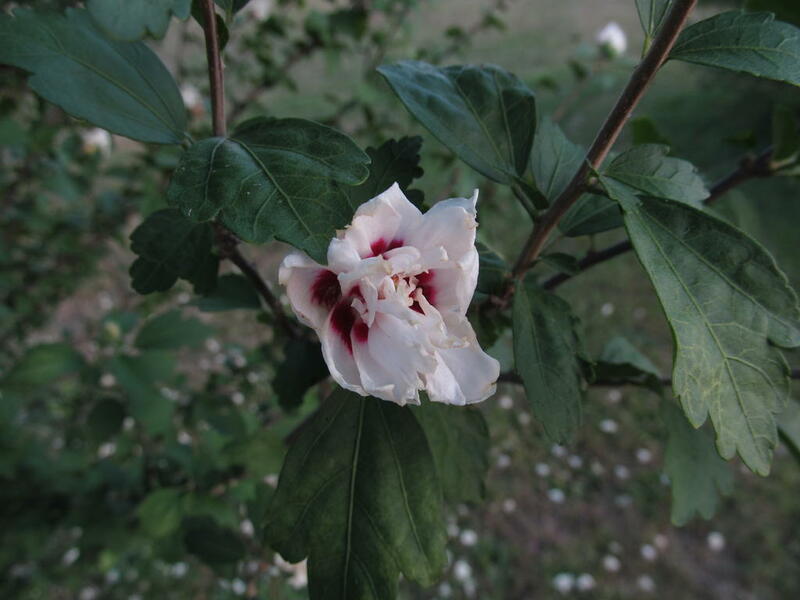 I looked in my records to find the earliest I had seen it in bloom, but couldn’t find any entries. Hmmm. Maybe this is one I learned after I quit being so conscientious about logging. So all told, it was a good day, even though I dumped my daughter (and my pride) in the drink. Beth, Jonathan, and I set out for our road trip. We are on the way to Kentucky to visit my family, and to go fishing with them in Arkansas. I haven’t been to Dad’s favorite fishing hole in about 19 years. That’s because I don’t really like to fish. Which is why I am bringing the canoe. I do not intend to fish. Instead, I will paddle up and down the Red River and try not to capsize. I used to be pretty good in a canoe, and have run class III rapids in this one on many occasions! So let’s hope that was just a fluke, and not a harbinger of things to come. Anyhow… we are in a hotel in Waynesboro, VA right now after a pretty long day of driving. When the whole family comes along we don’t usually get this far. We will stay here for two nights, and the NAD will pay for our room. I am meeting my friend Mark O’Ffill, the webmaster for Pathfinders Online, and we are going to work on getting the Pathfinder Honors Wikibook onto a NAD-hosted server so that we can expand it. The plan is to create a new Instructor’s Manual for the new Investiture Achievement curricula, which is more overtly religious than the Honors Answer Book. As such, it cannot adhere to Wikibook’s “Neutral Point of View” (NPOV) policies. The material will still be licensed under the Creative Commons – otherwise we could not do this at all. This project has been in the works for almost a year now, and tomorrow we intend to make some real headway on it. Meanwhile, what is the rest of the family up to? Va does not want to go fishing OR canoeing. I like to say that “she likes nature, she just doesn’t want to get any of it on her.” 😉 Therefore, she and David (and Penny) will meet us in KY next week after the fishing and paddling is all said and done. But before they arrive, Jonathan will have to head back home. He has an orientation session at UNH to attend (and less vacation at work than I do). So he will drive back before Va and David arrive. As you can imagine, the logistics for this trip have been a challenge! Today I was putzing around in my woods looking at some of the blueberry plants when the thought occurred to me that some of the early blueberries might be ripe by now. 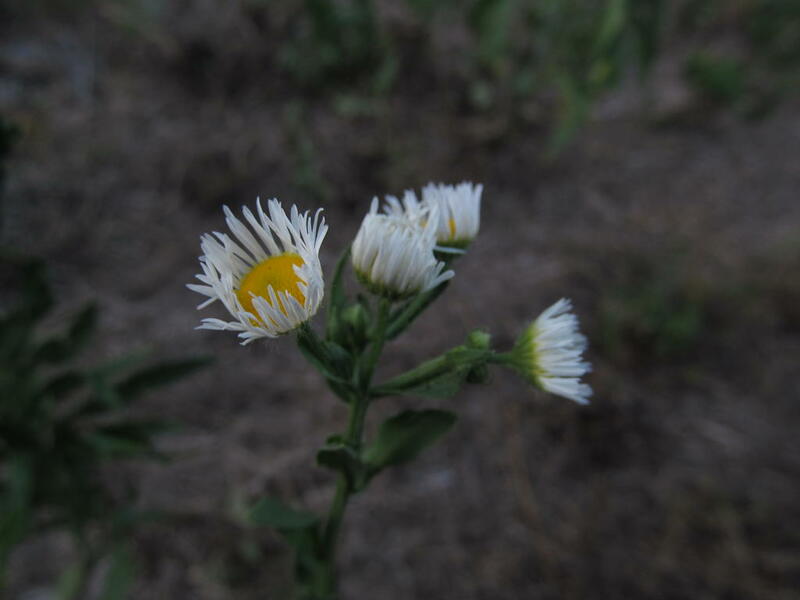 So I went to a small patch that always blooms early. Yup! Ate that one and two others. This little patch is at the base of a tree at the edge of the yard. It gets more sun than the ones growing in the woods, and I imagine that’s why it blooms and ripens earlier than its sylvan counterparts. 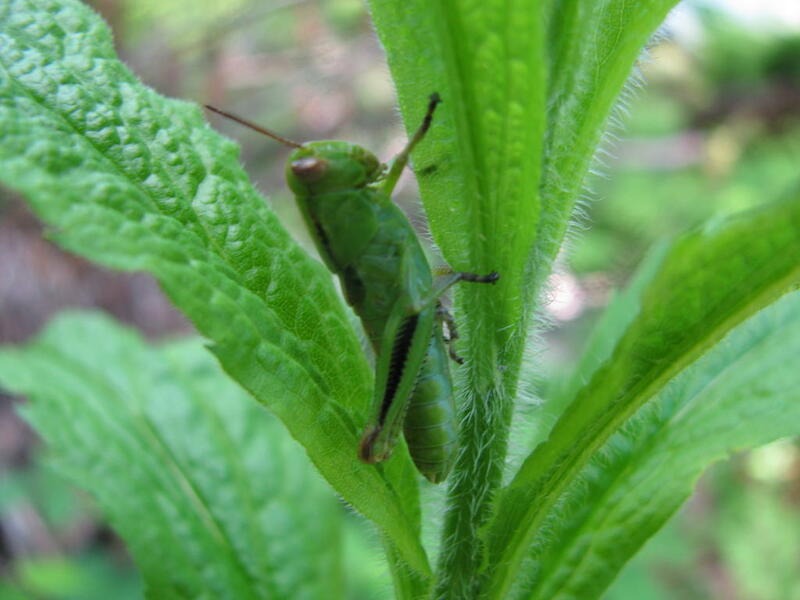 Not far from the early blueberries I spotted a grasshopper of some sort. I don’t know the species or the genus. I could look up the order I’m sure, but I just don’t have it in me tonight. As I walked through the yard, I caught some movement out of the corner of my eye. 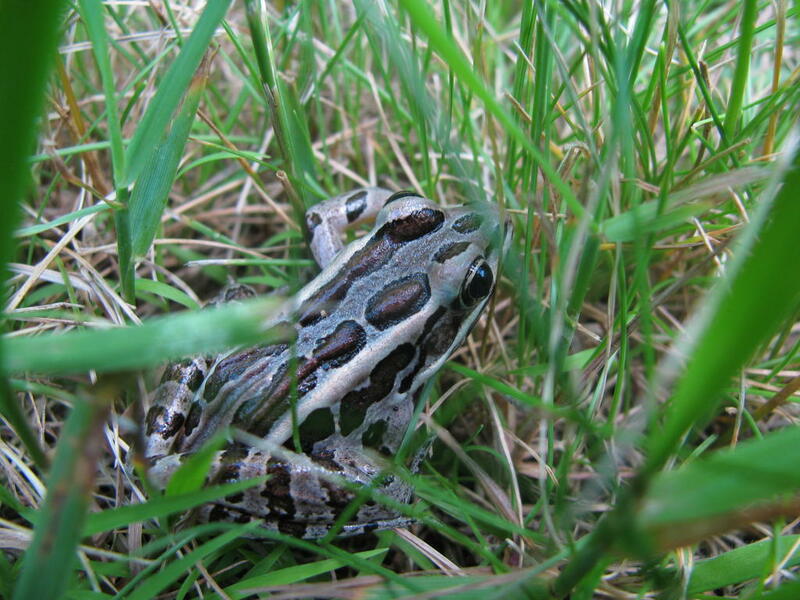 It was this pickerel frog (Rana palustris). I usually see one or two of these each year, so I’ve met my quota now. I will report this sighting on a site run by Fish & Game (they are interested in that sort of thing). 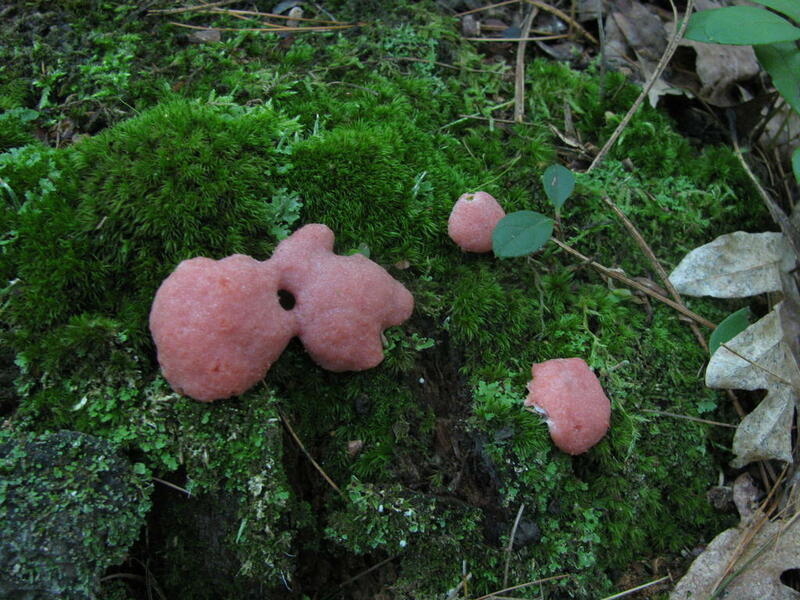 So now that I have given you a plant and two animals, we shall shoot for the middle ground – slime mold! Studies on Physarum have even shown an ability to learn and predict periodic unfavorable conditions in laboratory experiments. Yesterday I had an errand to run during lunch, and I did not take the direct route back to the office. I wanted to check in on this guy. This is the same plant I found back in December. I picked one then so I could let it ripen, but all I could get it to do was mold. 😦 You’re not supposed to eat them until they ripen as they contain alkaloids (which are toxic if ingested). Ripening eliminates the alkaloids, but alas! Mine molded and ripened at the same time, so I still don’t know if these are any good. I may never find out. Closer to the office there is a little street corner park (complete with benches). There is a bush growing in there that has the strangest fruits. I had no idea what sort of bush it was until I saw it today in flower. 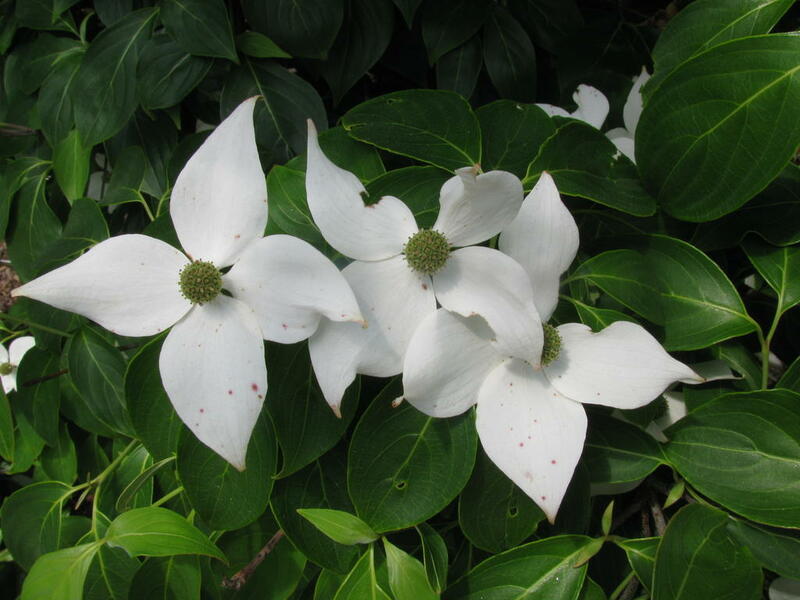 Dogwood! I don’t know what kind of dogwood, but it certainly is some sort. 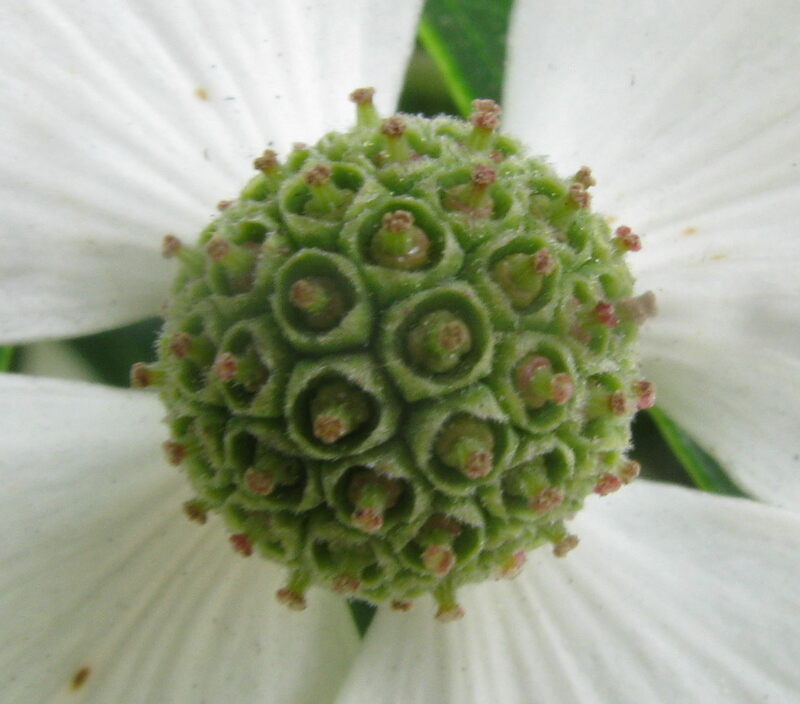 Here’s a closeup of the petals (those white things are bracts, not petals). The fruit looks a lot like this. Sort of an extraterrestrial basketball or something. Press the macro button for flowers. There’s a reason its icon is a flower. Use a long shutter time. Make the shutter delay a couple seconds after pressing the button so the camera has a chance to stop shaking from the button press. My camera simply cannot get this flower (or many others) in the Auto mode. 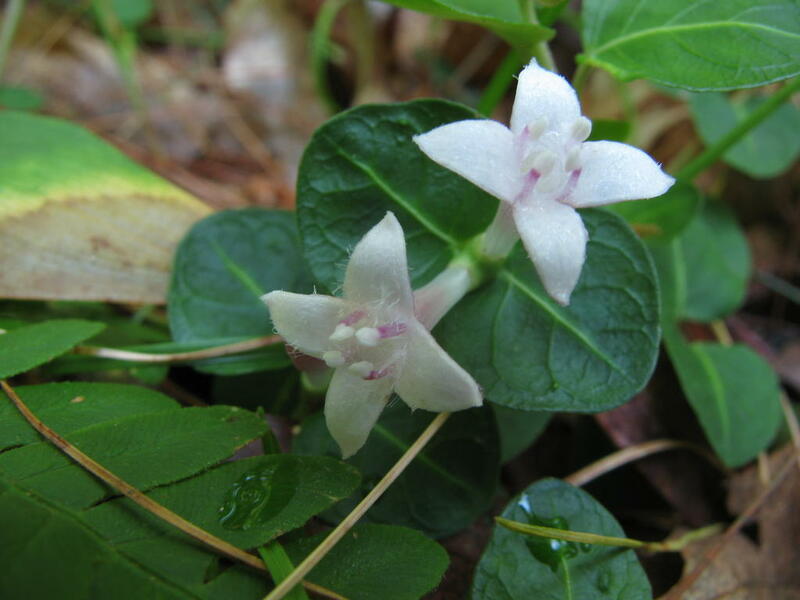 Especially not a white flower in the dark woods. Nope. The earliest I have ever seen this one in bloom is June 23, so it’s ten days earlier than ever this year (according to my records). After I took several shots of this one today, I went looking in all the other places in my woods where I have seen it growing. None of the other stands had any flowers. This stand might have another tomorrow. These flowers are infertile. The fertile ones are inconspicuous and stay beneath the leaves. I may have seen a fertile one last year, but I could not be certain. I can’t find any photos of the fertile flowers online or in any of my books. My tripod mount is still in deplorable shape, but I used the tripod anyway. I have to hold the camera on, and it’s not good to be touching it during a long exposure. But it’s still better than a handheld shot. 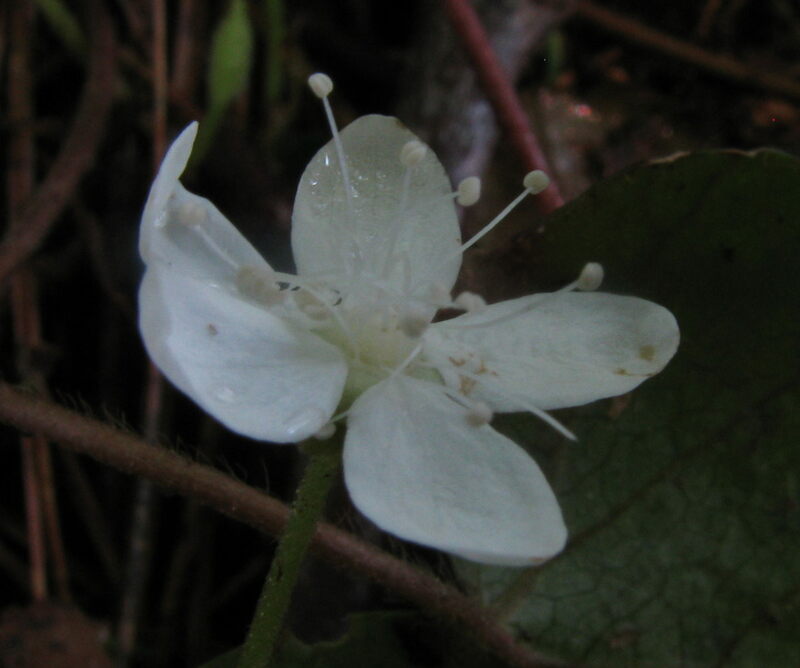 While I was in the balance-the-camera-on-the-tripod mode, I took a few shots of the partridge berry. More of them are in bloom today than yesterday. Not too shabby. 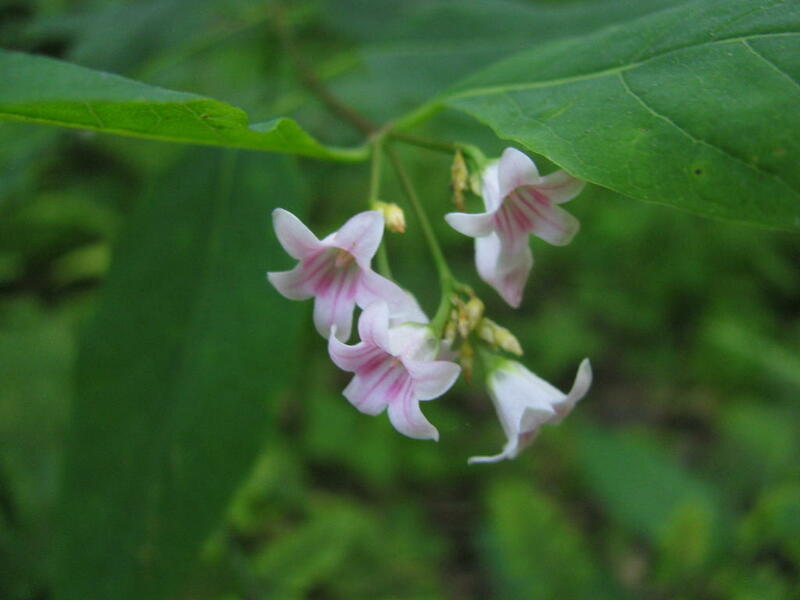 Note how the two blossoms are joined at their base. 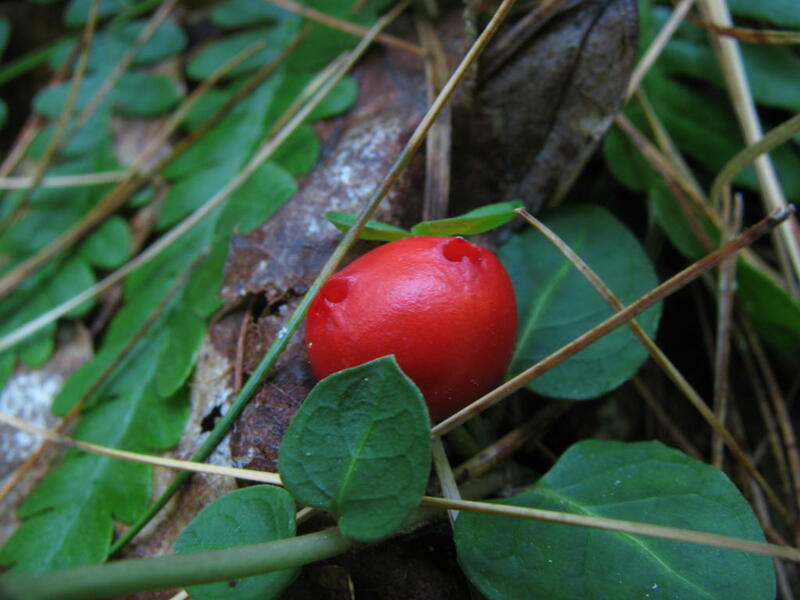 They will fuse together and turn into a berry with two eyes later on. Check it out. I took that one today. See the two eyes? Some people call these snake eyes. 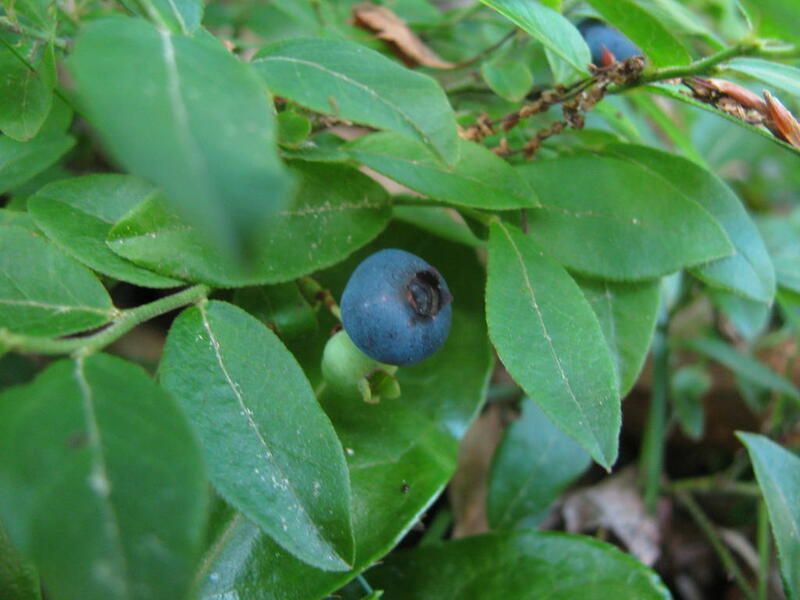 The berries persist through the winter, and won’t come off the plant until it flowers again. And since they are edible (and I really like them), they can provide a source of fresh berries almost year-round. 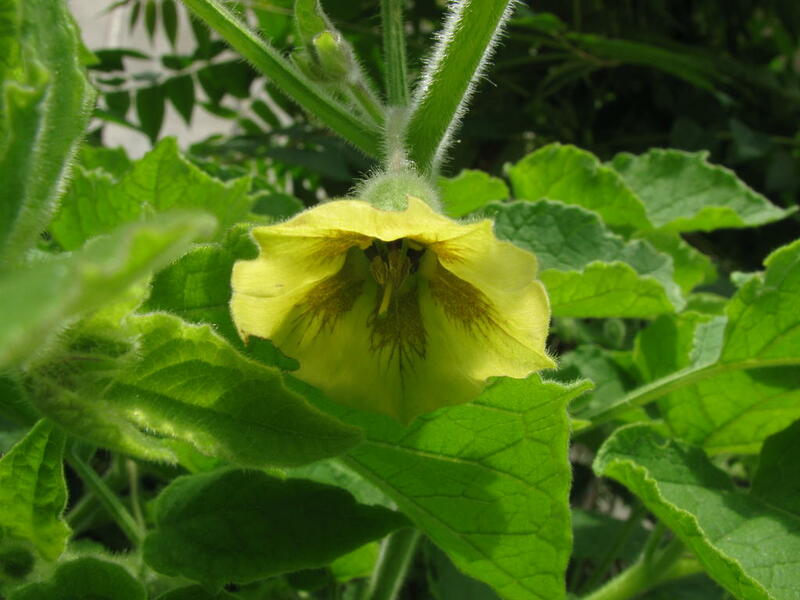 Thy only time you can’t get them is between the flowering and the ripening. And as this photo shows, you can even get them for a little while at least after they have flowered. They remind me a bit of apples. They are not too sweet, but just sweet enough. And those two flowers and two eyes? They make two seeds.